Our Durma CNC Press Brake had standard tooling we could use to manufacture this part. We discovered this method had several disadvantages; increased costs and production times as well as decreased precision and inconsistency. Our in-house tooling department custom designed and built THREE different tools to use in the press brake during the forming process. Each tool performed two bends at a time so that the bracket went through three stations for total completion versus six stations with the standard tools. This customized tooling allowed for a more continuous production system and increased the production rate. 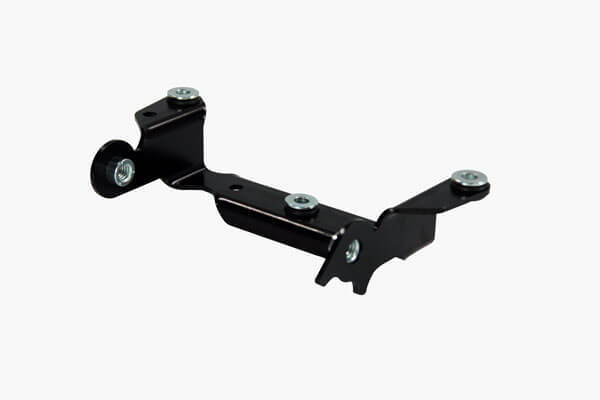 Grommets and pem nuts were inserted with no issue because Ultra’s manufacturing process produced a bracket frame and holes that precisely matched the design print. This manufacturing process in the press brake was much like a multi-station progressive die utilized in a stamping press; producing parts consistently and with greater precision. The customer couldn’t justify the cost of a progressive die based on quantities needed, but Ultra was able to deliver efficiency, precision and cost-savings using a press brake. This bracket did require laser work as well and Ultra incorporated quality checks for complete accuracy. Customized gauges measured the positioning of each hole to ensure correct placement. 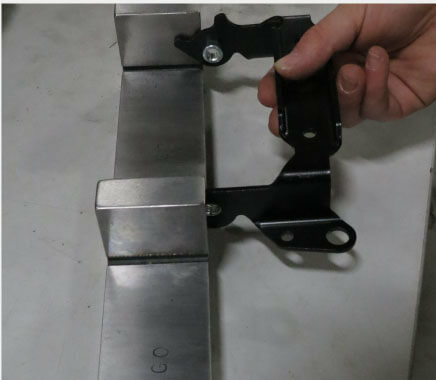 Ultra’s use of customized tooling in the press brake tripled the production output of this bracket. Production with the standardized press brake tooling was 31 parts per hour and with Ultra’s customized tooling the output was 93 parts per hours.